Happy Monday! Hope you had a good weekend! Sadly the cold weather is back so any of my spring purchases will have to wait a little longer to be worn. 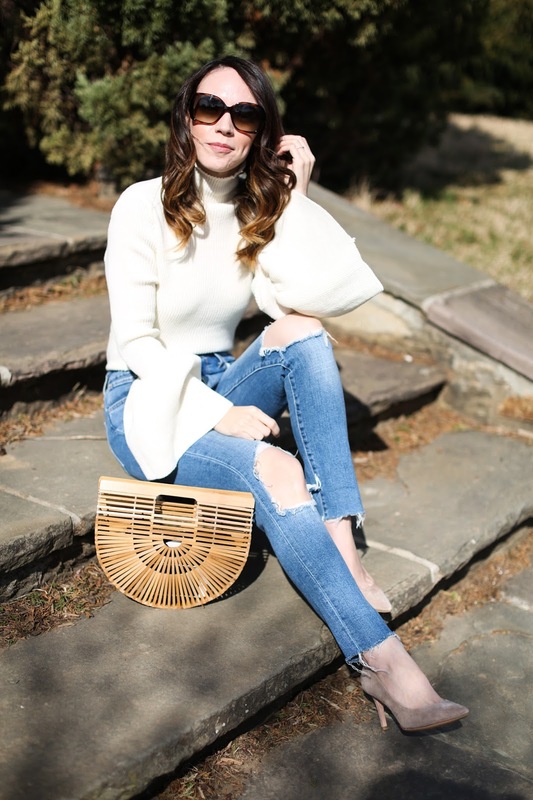 I do love a spring sweater however since it can be a great transition piece like this one I am wearing. I plan to carry my love for dramatic sleeves into spring because I find them incredibly fun to style. Some people find a bell sleeve limiting if you work at a desk but I used to wear ones at my old job and would just push them back while I was typing. I loved dressing up so much that I wouldn't let the fact that I was at a desk all day limit what I would want to wear. Some of the sweaters I rounded up below are not as dramatic as this one so they may be more suitable if you want something with a more conservative flare (and to allow for easier typing LOL!). I definitely am loving this trend however and find it makes a regular shirt or sweater so much more interesting!